Nolzman wrote: What is "dry-loop"? Dry loop means DSL without the dial-tone (phone service). Dry loop is a DSL line that does not have a phone line associated with it. They probably don't like to do because they have to assign a non-standard account number to the account. Houston, we (I) have a problem. I did as suggested in the thread above and I could not get a signal. I checked the wire bundle on the customer side of the NIB and the other pairs were orange and yellow, and green and white, not multi-colored. I tried the orange and yellow on the customer side (orange = orange/white and yellow = white/orange) as described, using the filters, and did not a signal. I then tried the other Green/Red connectors, again not signal. I then went out to look again and phone company side of the box came open (honestly), and that is when I noticed the multi-colored (Blue/white and white/blue) were on this side of the NIB. 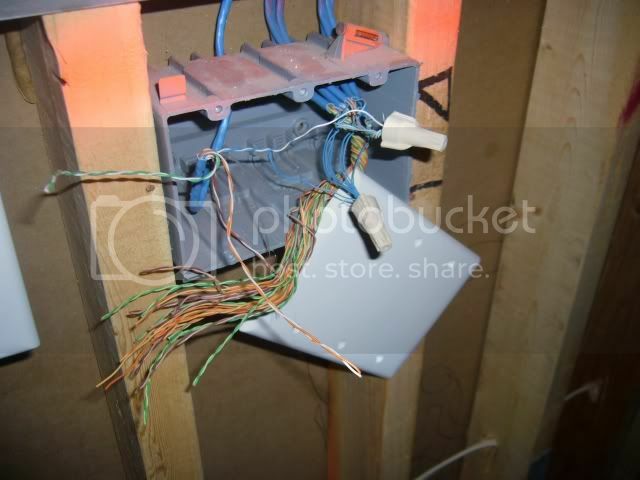 So, I disconnected the blue/white and white/blue wires and connected up the white/orange and orange/white with both the blue and white and the orange and yellow wires on the customer side and did not get a signal in the house. So, I hooked it all back up that way it was, blue/white and white/blue on the phone co. side, and blue and white wires on the customer side and I was back to normal. 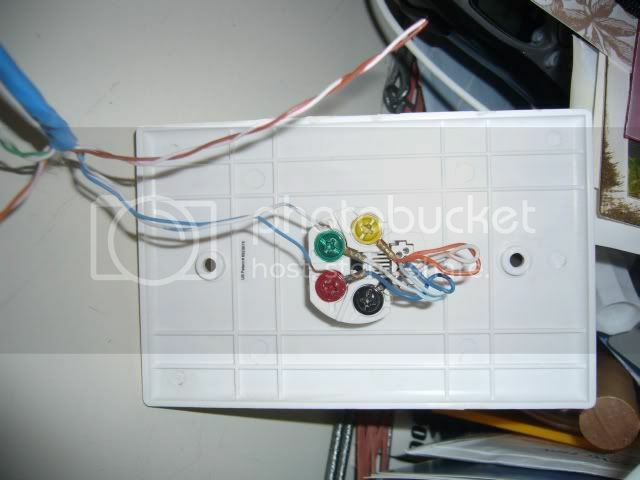 The multi-colored wires are on the phone co. side of the box. The customer side are solid colors. What now???? The pictures below show both sides of the box and my wire options. The goal is to use Ooma with my DSL and have Ooma provide the dial tone to whole house. As a last resort, I can switch to Comcast as my ISP and turn off my phone company completely, but I think I prefer my DSL. I would leave the left side alone; leave it as you found it. The objective is to get your telephone company signal into your house using a 2nd pair. Then have DSL modem connect to the 2nd pair in the house so you can use the 1st pair to distribute Ooma dialtone. However, it seems your house wire coloring is a bit unusual. 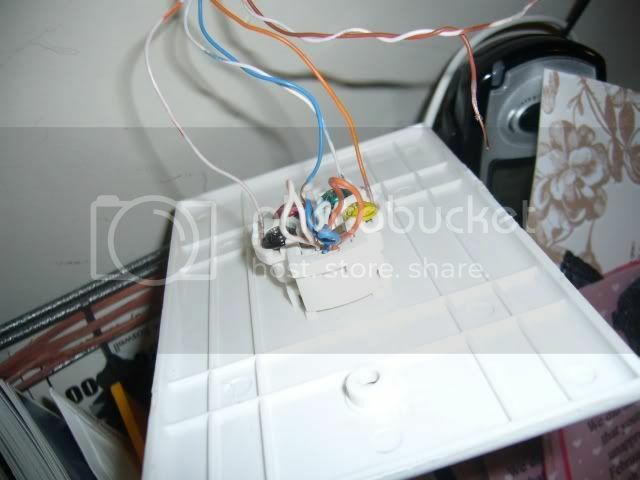 What needs to be done now is to open up one of your wall plates in the house and see what 2 color wire pairs are connected. Usually, there are 2 wire pairs connected to the plates so other than the blue pair, there should be another pair connected. That other pair should be the ones connected to the screw terminals on the right side of the NIB. I took your advice and did some more investigation and learned more how they wired my house. 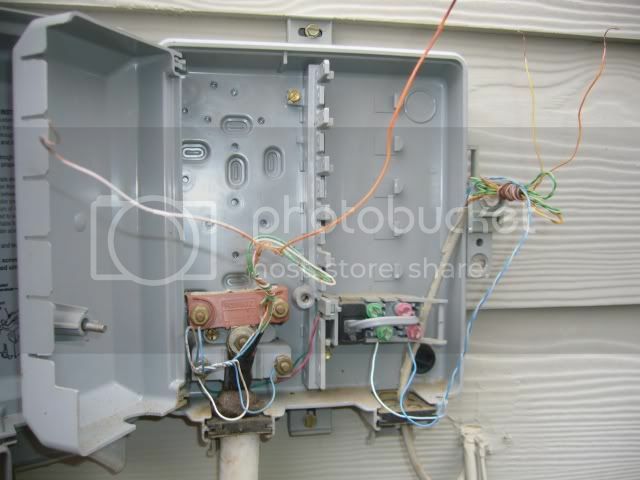 I also have a much better understanding of how the wiring works. But I still have a problem and I'm not sure anybody can help. Let me explain. Per the suggestion, I opened a wall jack and discovered that they only wired one pair of wires (see below), which would explain why my previous attempt did not work. So I found and opened the telephone wire hub in the basement, and confirmed only pair were actually wired up. So, proceeded to wire up another pair of wires. I figured I only needed to wire up the second pair for the wall jack I'm using for the modem and one other to keep the old phone active on for while on Line 2. But I didn't know which wires were which in the bundle in the basement, so I had to connect them all up. I picked the Orange and White (Yellow), to wire up. See the last picture below. This should have worked and it did for most the part, but not where I needed it. I did a lot of trial an error, but in the end I did get Line 2 active on two of the three wall jacks that I wired up with the orange pair, but for some reason the jack needed for the Modem would not come active for Line 2. I tested a jack downstairs and upstairs (besides the Modem jack, upstairs) with a phone using the L2 (Line 2) adaptor and they got a dial tone. I even put the orange pair in the LIne 1 connections on the jack in question, to no avail. It's like somehow the jack in the room with the Modem is wire differently, but when I hook the blue pair back up outside it works. ANY SUGGESTIONS!!!! 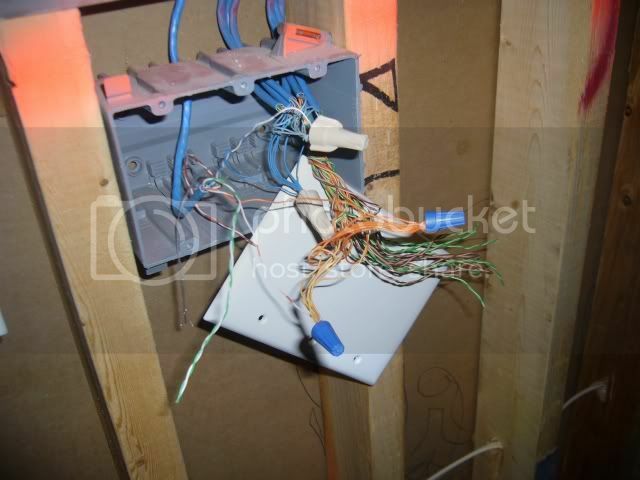 Looks like your wire hub has 1 wire bunch coming from the NIB and the rest going into your rooms. Why are some wire pairs orange/yellow and some orange/white with orange stripe? Use a couple of wire nuts and connect up all browns together in the wire hub. Then another wire nut connecting all the whites with brown stripe together. At the plate where you want to connect up a modem via the L1/L2 splitter, leave the blue connection alone, connect the brown to the yellow screw, and white with brown stripe to the black screw. You don't have to touch any other wall plate. Undo the plate changes you've made to other plates if necessary. At the NIB, connect the brown to the red screw and white with brown stripe to the green screw. I couldn't figure the wire coloring difference either. However, after looking at all the wiring, it appears that all the "blue" wire pairs are Blue and Light Blue (including the one coming in from outside) except one. The one exception appears to go to the wall jack in the kitchen, which is the one I took pictures of. I picked this one to review, because it was easy to access. The one in the kitchen was one of the two that worked. The other one was upstairs in the MBR, and it had a Blue/Light Blue combination. It was like one wire run was from a different batch. At first I thought the one different wire was the one coming in from outside but it was not. Based on what I saw I don't think it mattered which pair I picked. I can try another pair (Brown pair), but I don't think it will make a difference. Remember, I got two of the three wall jacks I changed to the Orange pair to work with Line 2. Why would the Brown pair be different than the orange pair? Any technical reason or suspicion?? If trying another color pair does not work, I may just switch over to the Cable ISP (Comcast). I currently have no cable in house, but using DSL is getting unnecessarily complicated. Just wanted to make sure you don't mix up wires. No other reason. Whatever 2nd pair you select, you just need to connect all the ring wires together and tip wires together using 2 wire nuts at your wire hub. Then, you just need to get the wall plate at your modem configured with 2 wire pairs. You can leave all your other plates connected only to the blue pair. Then, at the NIB, make sure your 2nd pair is connected to the screw terminals. Then, you can access DSL through the plate you modified and then you can distribute Ooma dialtone via the blue pair. Yea, that's exactly what I did. I checked and rechecked the wire connections. The last picture above show the Orange pair connected together with the blue wire nuts. That is what I did. The Blue pair (Blue - Light Blue or Blue\White) were already connected up as Line 1. I even unconnected the Orange pair bundle and connected it back up being very careful to get all the wires. I really don't see anything wrong with what I did, and the two wall jacks I got working on Line 2 prove it. I guess I can try another color pair. Maybe there is something wrong with Orange pair wires to the one Jack that does not work??? I understand how it works now, it's just not working like it is supposed too. It is strange that all the wires are color/light coler, except the one that has the color/white and color. That one is even separated out from the group. And based on the three wall jacks I open the "white plus color" bundle goes to the kitchen phone. Any reason for the different colors???? Does not make sense. As I stated, the wire coming in from outside was one the Blue/Light Blue bundles. Maybe when they ran the wires they intended for the Blue / White and blue to be run from outside, but made a mistake on the run and left it. That is the only thing that makes sense. 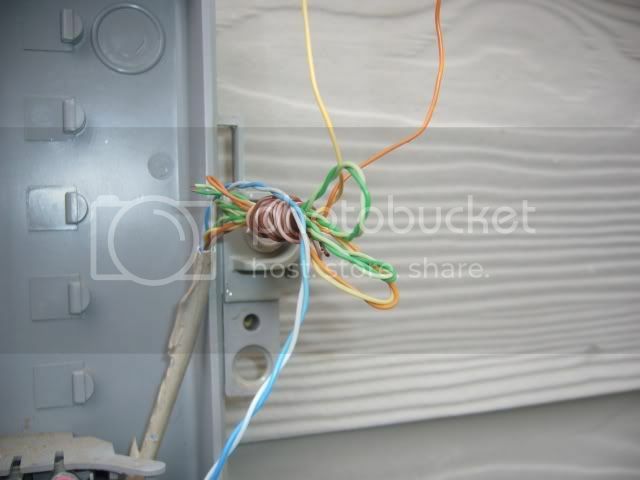 On the blue wire nut that connected all the yellows together, why do you have a white with brown stripe connected (seems that way from the pic)? Kitchen wall plate seems to have the white with orange stripe connected to the tip.